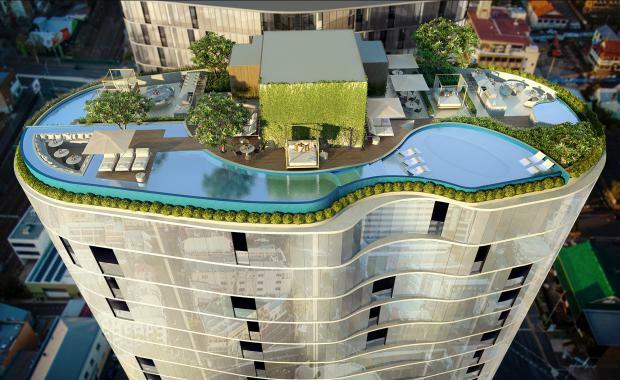 Property developer GURNER has announced the launch of the third and final building in its ‘FV’ project at Fortitude Valley in inner Brisbane. The launch follows the sell-out of the first two buildings which sold all 651 apartments totalling over $340 million in just over 12 weeks. Titled ‘No.1’, the building includes 3,000 sqm at ground level dedicated to retail, café and restaurants on Brunswick Street. “I hold New York’s luxury apartment market in great esteem, and having been inspired by the luxury concierge offerings which are considered standard in some of the city’s best apartment buildings, I wanted to bring that level of service and attention to detail to FV," Mr Gurner said. “The building will offer a personal concierge service for residents, which will mirror the level of service provided at the world’s most prestigious hotels. The concierge will be able to book your appointments, have your car washed, research restaurants for you, receive your shopping; basically any request you would ask of a hotel concierge, you will be offered that same level of service at FV." “We have included so much amenity and quality in the development to ensure that we are competing with only the very best buildings in town and our owners and investors will always have security in leasing and re-sales. “ While many would assume this level of amenity comes at significant cost, the opposite is true; due to the building’s design efficiencies and scale we are able to deliver this amenity at minimal extra cost to the purchaser. “With a lot of talk surrounding the many new developments rumoured to be coming to the market in Brisbane in the coming months, we wanted to ensure that purchasers who are buying into FV – or any GURNER project for that matter – are benefiting from a unique point of difference not offered anywhere else in the marketplace,” he said. In what is a first for new developments in Fortitude Valley, No.1 will also offer a state-of-the-art Business Club, offering a conference centre, library, boardroom, private dining room, lounge and bar, located on level 5.